With the collapse of the Socialist Federal Republic of Yugoslavia (SFRY) in 1992, the two remaining constituent republics of Serbia and Montenegro agreed to form a new Yugoslav state which officially abandoned communism in favour of forming a new Yugoslavia based upon democratic institutions (although the republic retained its communist coat of arms). This new rump Yugoslavia was known as the Federal Republic of Yugoslavia (FRY). The Socialist Republic of Serbia became known as the Republic of Serbia in 1990 after the League of Communists of Yugoslavia collapsed, though former Communist politicians would exercise influence for the first ten years, as the ruling Socialist Party of Serbia was directly descended from the League of Communists of Serbia. Serbia appeared to be the dominant republic in the FRY given the vast size and population differences between the republics; internally however, the two entities functioned independently while with regard to foreign affairs, the federal government had comprised Montenegrins as well as Serbians. Slobodan Milošević, President of Serbia from 1989 to 1997 and President of Yugoslavia from 1997 to 2000. Zoran Đinđić, Prime Minister of Serbia from 2001 to 2003. The politics of Serbia in the FRY continued to support Serbian interests in Bosnia and Herzegovina and Croatia whose Serb populations wanted to remain in Yugoslavia. Since 1989, Serbia had been led by Slobodan Milošević, a former Communist who promised to defend and promote Serb interests in Yugoslavia. In 1992, he and Montenegrin President Momir Bulatović formed the Federal Republic of Yugoslavia. Many critics on the international stage saw Serbia as the dominant internal unit of the FRY, in which Serbian President Milošević seemed to have more influence on federal politics than the Yugoslav President (the first federal president, Dobrica Ćosić was forced to resign for opposing Milošević). The Milosevic government did not have official territorial claims on the Republic of Macedonia. Others have claimed that Milosevic only advocated self-determination of self-proclaimed Serbs who wished to remain in Yugoslavia. During the Yugoslav Wars in Croatia and Bosnia & Herzegovina, Milošević supported Serb separatists who wished to secede from these newly created states. This support extended to controversial figures such as Bosnian Serb leader Radovan Karadžić, and accusations by some international figures claimed that Milošević was in charge of the Serb factions during the war and had authorized war atrocities to occur. 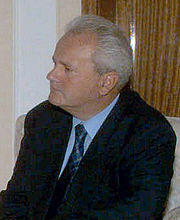 In 1995, Milošević represented the Bosnian Serbs during the signing of the Dayton Peace Agreement. Milošević continued to be President of Serbia until 1997 when he retired as Serbian President in 1997 and became Yugoslav President. Milan Milutinović took over as Serbian President from Milošević that year. From 1996 to 1999, severe political instability erupted in the Albanian-populated province of Kosovo in Serbia. This caused the Kosovo War and in 1999, Serbia and Montenegro were bombed by NATO aircraft which included the Serbian and federal capital of Belgrade. Afterwards, Belgrade agreed to relinquish control of the province of Kosovo to a United Nations autonomous mandate. The Yugoslav Wars resulted in a failing economy in Serbia and anger at the federal presidency of Milošević. The wars and their aftermath saw the rise of Serbian ultranationalist parties, such as the Serbian Radical Party led by Vojislav Šešelj, who in his rhetoric, promoted the idea of Serbs continuing to live in a single state. Šešelj participated in the ethnic Serbian campaign against Croats and Bosniaks during the Yugoslav Wars. Šešelj was twice arrested in 1994 and 1995 by the Yugoslav government, but eventually became Vice-President of Serbia from 1998 to 2000. In 2000, Serbian citizens protested against elections when Milošević refused to stand down from the Yugoslav Presidency following elections as allegations of voter fraud existed. Milošević was ousted on October 5, 2000, and officially resigned the following day. He was later arrested in 2001 by federal authorities for alleged corruption whilst in power, but was soon transferred to The Hague to face war crimes charges. After the overthrow of Milošević, Vojislav Koštunica became the President of Yugoslavia. In 2002, Milošević's ally, Serbian President Milutinović resigned, thus ending twelve years of some form of political leadership of the Socialist Party of Serbia over the republic. Boris Tadić of the Democratic Party replaced Milutinović. In 2003, following the new confederation. Serbia became one of the constituent states within it along with Montenegro. The confederacy arose as Montenegrin nationalism was growing. Montenegro had for some years used external currency as legal tender, this began with the German Mark, and since 2002, became the Euro. Serbia, however continued to use the Yugoslav Dinar, and the national bank of Yugoslavia. Serbia's attachment to the confederation would be its final subordination until its independence was declared in 2006 following Montenegro's declaration of independence from the confederation following a referendum on independence shortly prior. Between 2003 and 2006, Serbia was faced with internal political strife over the direction of the republic, Serbian politicians were divided over the decision to create the loose state union in the first place. Zoran Đinđić who was seen as a major proponent of the state union was criticized by the former Yugoslav President Vojislav Koštunica. The anger of nationalists over Đinđić's positions resulted in sudden assassination in March 2003 which caused a state of emergency to be declared. In 2004, pro-European Union political forces united against nationalist forces who opposed Serbia's entry into the EU until the EU recognized Serbia's sovereignty in Kosovo. Throughout most of the 1990s and early-2000s sanctions were held against Serbia.